Palo Alto, California was probably about the best place Dwight and Louise could have selected for their retirement. Having lived there previously during Dwight’s time as a Fellow at the Center for Advanced Study in the Behavioral Sciences from 1969-1970, they were quite familiar with the area. The weather was mild–no more Massachusetts winters–and there was only one step up into the single-level Palo Alto house, unlike the multi-level Belmont house which was hard on Louise’s knees. 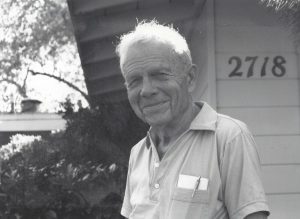 Stanford University appointed Dwight as a Visiting Professor Emeritus of Linguistics, which led to his serving as an adviser for linguistics graduate students, and which meant that he had free use of Stanford Library. He also could take advantage of the shuttle between the Stanford and U.C. Berkeley campuses. And it was the Stanford Library, Special Collections, to which Dwight would leave his papers after he died. Family connections were also a consideration in selecting Palo Alto. 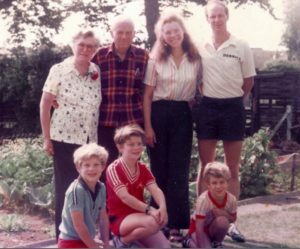 Their son, Bruce, and Louise’s two sisters, Mimi and Malvina, and their families lived in California. Dwight and Louise quickly made friends with their neighbors on Ramona St. There was a Co-op market close by and the streets were perfect for bicycling, Dwight’s favorite exercise. Professional colleagues of Dwight living in California or passing through San Francisco could conveniently pay them a visit. 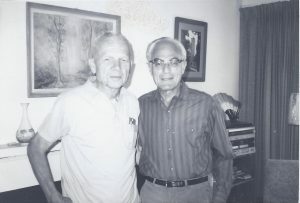 Dwight with Joseph H. Silverman of UC Santa Cruz, a former student of his, shown here at the Palo Alto house. On the wall in the background are a painting by Louise and a photo by Bruce of a tower in Rothenburg ob der Tauber, a medieval German city. 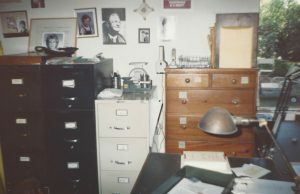 The house even had a spare bedroom which Dwight turned into a study, unlike Los Angeles where he had to use the garage and Belmont where he was in the attic. Filing cabinets and bookshelves lined the walls and a window provided a view of the back yard. 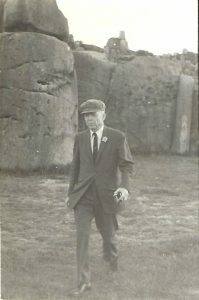 Photo taken 1988. 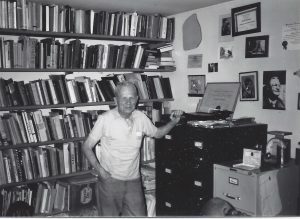 Dwight in his study, probably late 1980s, Palo Alto. Pictures on the wall include his father, AJ; son, Bruce; grandson, “little” Bruce; and Ann and Derrick. A replica of the Rosetta Stone appears at top left. CATESOL NEWS, Vol. 14, No. 4, December 1982, pg. 8. “LACUS was founded in August 1974 by a group of linguists of the Great Lakes Region. Their plan was to create a forum for the free flow of ideas and discussion on human communicating behavior from all possible points of view, going beyond traditional grammatical studies in the various tradtional modes. “Their thinking was in part influence by an enjoyable informal meeting held the year earlier, in the summer of 1973 in Seattle. It was a time of lively argumentation and occasional intolerance at meetings of established linguistics organizations. 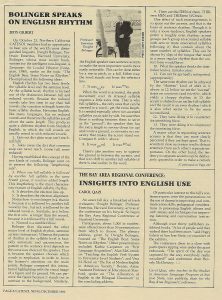 “As the inaugural meeting of 1974 at Lake Forest College drew to a close, it seemed clear from the reactions of those present that many linguists from around the world would respond positively to such an organization. Honors came aplenty during retirement. Fellow, American Academy of Arts and Sciences (1973); Orwell Award, National Council of Teachers of English (1981); Corresponding Member, Royal Spanish Academy (1988); Corresponding Fellow, British Academy (1990). Palo Alto was a favorite destination for the McClures and their three sons. 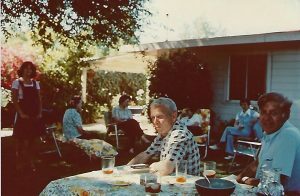 Dwight with neighbors in the back yard of the Palo Alto house. Louise is sitting on the chaise longue wearing a light blue top and looking at Ann who is seated in front and slightly to the left of her. 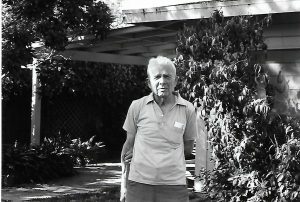 Dwight in the backyard of the Ramona St. house, probably late 1980s. Dwight relaxing at picnic bench, probably at a Palo Alto park. During his retirement in Palo Alto, Dwight had an impact on California politics and election law. The California State Supreme Court had declared unconstitutional the provision of law determining the order of the names of candidates on the ballot–incumbents first with everyone else in alphabetical order. His son, Bruce, was then working for the California Legislature on election law reform. There was a need to establish a new rule on ballot order of candidates’ names but the Legislature had been unable to agree on what it should be. Bruce discussed this with Dwight who came up with a simple solution: have a drawing of the letters of the alphabet at each election to create a random alphabet which would be used to determine the order of the candidates’ names in all election contests. The Legislature enacted the new law. For a more details, see the following pdf file: Something New in Ballot Alphabets, Sacramento Bee, Oct. 19, 1975. During their years in Palo Alto, Dwight and Louise had the opportunity for some travel, including Spain, Peru (1973), and Austria (1977). 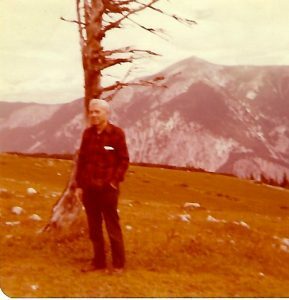 Dwight, Peru, 1973. The background looks like one of the monuments near Cuzco. The photo probably was taken by Louise. One of the conferences Dwight and Louise attended was held in a castle in Austria. This photo, probably by Louise, is from Austria in 1977 and very likely from that conference. 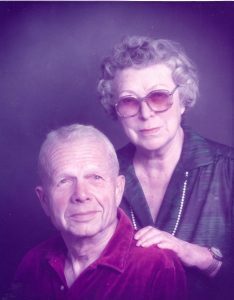 In 1980, Dwight and Louise’s son Bruce married the former Charlotte Brux McKinney. Bruce and Charlotte moved to Nevada City, north of Sacramento, where he went to work for Nevada County. Dwight and Louise would make trips from Palo Alto to the picturesque Gold Rush town of Nevada City to visit them. 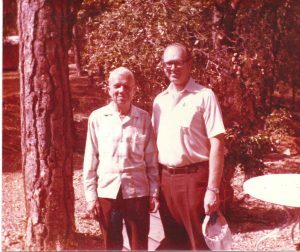 Dwight and Bruce, 1980, near Nevada City, CA. Bruce and Charlotte moved to Nevada City that year and were married that August. 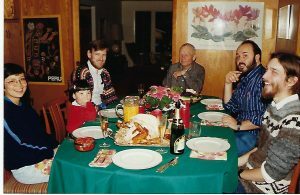 Christmas 1987, the first Christmas Dwight was on his own. He had been invited to the home of a young family he knew to share Christmas. It seems likely that he knew them through his Stanford connections. 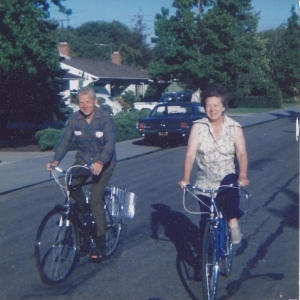 Undated photo of Dwight and Louise, probably taken in Palo Alto. 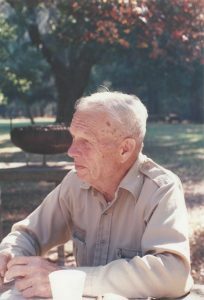 Robert Stockwell, in his obituary of Dwight for Language, wrote of Louise’s role in Dwight’s career: ” She also was the critic to whom Dwight submitted every word before anyone else saw it; she commented extensively, and did much of the final typing for him.” (Their daughter, Ann, thinks this might be a bit of an overstatement, at least as far as technical material was concerned. Bruce can recall discussions between Dwight and Louise about how best he should word some other things, such as correspondence and recommendations.) Because she was fluent in French, she could also translate articles on linguistics from French to English. She spoke Spanish, which helped with his professional relations with colleagues from Spain and Latin America, and, of course, conducted all the social duties expected of a university professor’s wife. 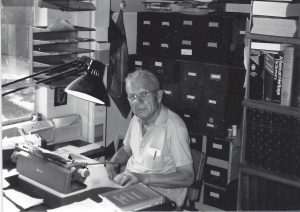 In 1943, when Dwight applied for a Sterling Fellowship at Yale, he headed for the Topeka Post Office on his bicycle, carrying the application with him to mail, but lost it on the way. Thinking that he did not really have any chance of being awarded the fellowship, Dwight was ready to forget the whole matter and not bother to make out a new application. It was Louise who retraced every inch of his route, found the application where it had fallen out of his pocket, and mailed it. The Sterling Fellowship was followed by his appointment to U.S.C. Dwight’s professional success was certainly, in large part, the result of the support he had from Louise. Her death in 1986 was a great blow to him.